There really isn't much of a story to go with tonight's entry. I had no idea what to make for dinner, so I simply drove to the market, planted myself firmly in the produce section, and waited for inpiration. Fortunately, the produce gods came through, by casting my gaze at two plump, fresh portabella caps. The rest just fell into place. I think Carla was a little concerned when she asked what I was making, and I responded, "I really have no idea." Then I threw her out of the kitchen. Anyway, this is a relatively simple dish (meaning few ingredients), and I think that with a little practice, it could make the coveted "under 30 minutes" category. Mix 1/4 cup white cooking wine, mustard, and sage in a large, shallow bowl. Add tofu and mix to coat. Steam broccoli florets in a vegetabole steamer for 20 minutes, or place broccoli in a microwave safe bowl with 1/4 cup water and microwave for 4 minutes. Pour 1/2 cup white cooking wine in a large skillet. Place portabella caps in skillet and cook on medium heat, stem side up, for 5 minutes. Turn portabella caps, sprinkle basil on top, cook for an additional 5 minutes. Add more white cooking wine as needed. Place tofu and mustard in a medium skillet and cook on medium heat for 5 minutes, stirring frequently to prevent sticking. Transfer portabella caps to plates, stem side up. Place tofu, tomatoes, and steamed broccoli in a bowl (I use one of those food storage containers with a lid) and shake to mix. Don't worry, you didn't miss a step - I didn't cook the tomatoes. 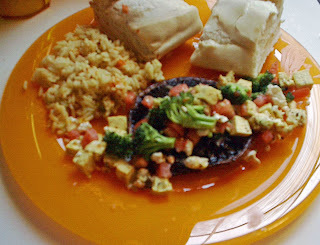 Spoon tofu and vegetable mixture over portabella caps. Sprinkle dried parsley on top. That's it! As you can see, I served this dish with vegetable rice and french bread, and it all turned out quite nicely. The picture's a little fuzzy, but what can I say... I need a new digital camera. And Carla, who had been watching from the living room, said she was quite pleased with my creation. Especially since she saw me mix white cooking wine and mustard together, and was convinced that dinner was indeed doomed. Admittedly, it's a bit of an odd combination, but sometimes you have to experiment to get out of a food rut. Yay! You added a picture - I love it! !